*Thanks Bounty for sponsoring this post. I don’t know about you, but I have a hard time getting excited about spring cleaning. Sure, I want the house to be all sparkly, but as someone who doesn’t love to clean (I wish I had that gene), the project can seem daunting. Plus, when the weather is beautiful, all I want to do on the weekend is get outside. Over the years, I’ve developed a routine that makes spring cleaning more manageable. 1 Today I thought I would share some of my best spring cleaning tips! Today I thought I would share some of my best spring cleaning tips! One of the first things you need to do is identify all the products you will need. Make sure to have the basics like trash bags and paper towels on hand. You know what else I love? 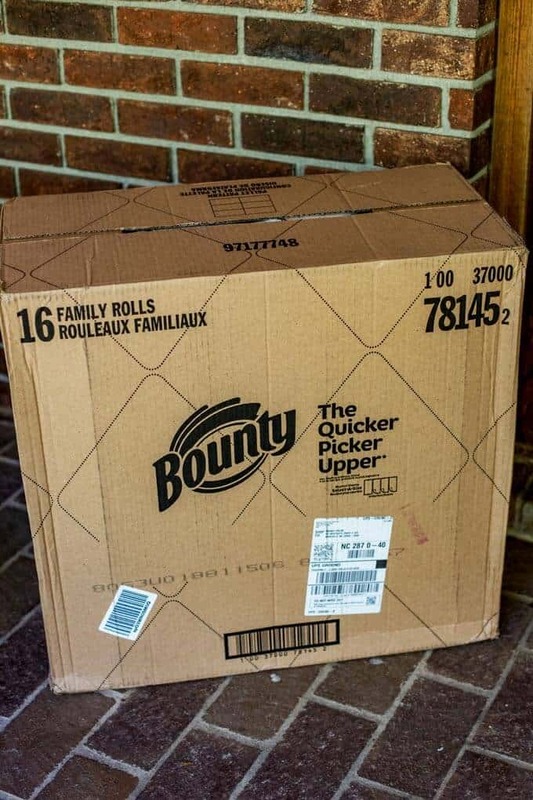 Getting essentials like Bounty Quick-Size Paper Towels delivered right to my door. Right now you can save up to $7 on them when you order them from Amazon. Use the promo code: 5QUICKBOUNTY on Amazon. When you apply the additional $2 off coupon on Amazon, you can get a total savings of $7. SCORE! Just what I need to power through spring cleaning! If you are like me and like to make most of your cleaners, you will want to stock up on vinegar, baking soda, Castille soap, borax and washing soda. Otherwise, make sure you have all of your favorite cleaners on hand. I find that with spring cleaning, it is beneficial to start by making a list of everything that needs to happen. It is a great way to make sure you don’t forget anything, and also hold yourself accountable. I start by walking through the house, taking notes of everything that needs to be done. Once I have a comprehensive list, I like to prioritize it and then plan out the order everything should be done in. Remember, when you are cleaning you should take a top-down approach! This prevents surfaces you have already cleaned from getting dirty again. It is time to get all hands on deck! I have a habit of trying to do everything myself, but this is the one time of the year when that strategy isn’t sound. There is just too much that needs to be done. I let the family know ahead of time that we are going to be spring cleaning and everyone – even Skye – is expected to help. While I am not big on rewarding my kids for basic responsibilities, spring cleaning can tend to bring on more tasks that do deserve rewards ☺. The deal is not just that they have to do everything asked of them, but that they have to do it with a great attitude. It is amazing what a highly motivated teen boy can accomplish. Cleaning will be much easier if you’ve got clutter under control. With three kids, clutter is an ongoing battle at our house. I like to tackle clutter control a day or two before our official spring cleaning. This is a great time to implement some smart storage strategies. As an example, we keep a basket for shoes by the front door. Not only does it keep me from tripping over shoes left in the middle of the family room floor, but it is also a huge time-saver when we are trying to get out the door. Other examples include a small tray in the kitchen for mail and a basket for magazines by my favorite chair. It is best to wash windows very early in the morning because direct sunlight can cause them to streak. Even better: pick a cloudy day. Start by dusting them and then mix equal parts vinegar and water in a bucket. Use a sponge to wipe the windows. Then use a squeegee to wipe the glass in a straight stroke. Dry the squeegee with Bounty Quick-Size Paper Towels and repeat. Screens should be washed in an area with good drainage. Use a wet scrub brush to clean, and then rinse thoroughly with the hose. Allow to dry completely before re-hanging. My dishwasher takes a lot of abuse! I like to clean and descale the inside by filling a cup with vinegar and then running it on high heat while the dishwasher is empty. For standard dishwashers (not drawers) the vinegar should be placed on the top rack. For extra cleaning power, sprinkle baking soda in the bottom of the dishwasher and let it sit overnight before the vinegar wash.
Lamp shades can collect a lot of dust! The easiest way I have found to tackle this on unpleated lamp shades is with a lint roller. (This is an excellent job for the kids.) Pleated lamp shades are best cleaned with a vacuum cleaner. Removable glass pieces from light fixtures can benefit from being run through the dishwasher. If they are not completely dry, use Bounty Quick-Size Paper Towels to dry the fixture before rehanging. We can get so busy cleaning inside, that it can be easy to forget outside. Clean up your deck or patio floors, sidewalks, and driveway. Don’t forget to clean your gutters and soffits, patio furniture cushions, outdoor light fixtures and garage doors. I like to get the kids to help scrub pots before I plant them for spring. 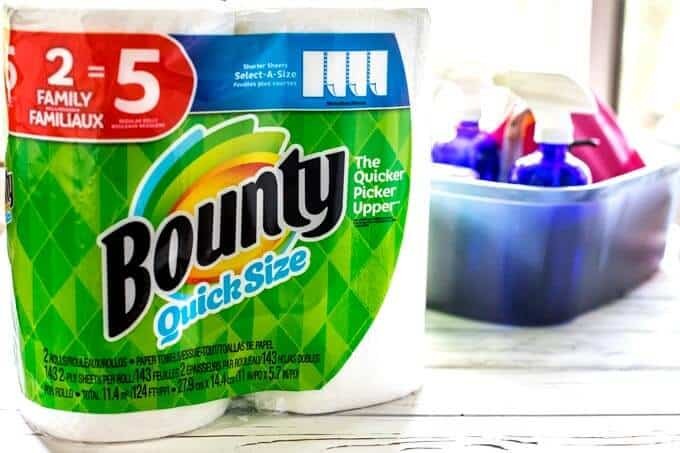 Remember to use the promo code: 5QUICKBOUNTY on Amazon to get $5 off Bounty Quick-Size Paper Towels! Shop Now. Thanks for the great tips! This is not a spring cleaning thing but an everyday thing in my home. I have an elder dog which means frequent messes. I have tried “saving money” on other brands but I use three times as much. Bounty IS the way to go! ‘Tis the season for Spring cleaning! I actually just used Bounce to clean my balcony and wipe down windows. As I was doing this I was like, I need a squeegee. I love getting deals on Amazon. It saves me the time and hassle of going to the store and having to lug things home. 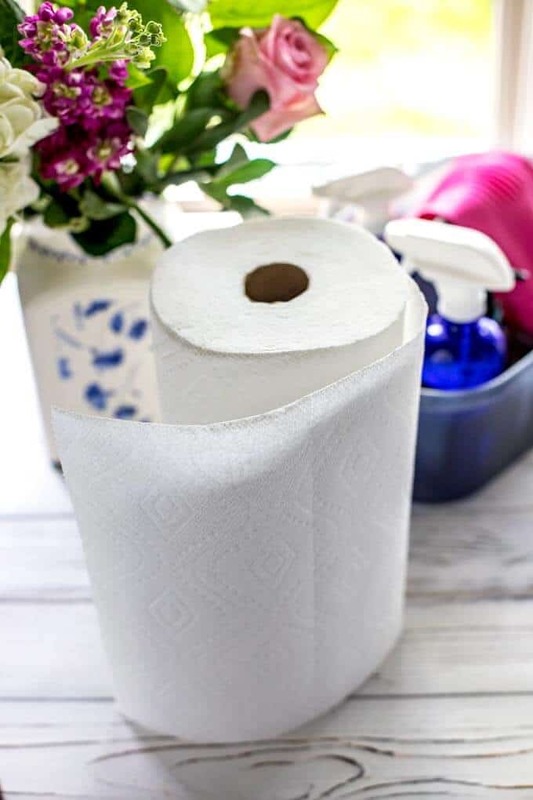 Thanks for sharing – I can always use paper towels! Those are great cleaning tips making a list and to make involve the family members is one of the best things to make the cleaning time faster. Always wear a protective equipment when you are cleaning and clean all the tools and cleaning equipment after using it. I have never heard of a gel air freshener before but now I must look into them. I love having a fresh scent in my home, this sounds perfect! We only use Bounty in our home. It is the best papers towel out there! Awesome tips! Spring cleaning is difficult and getting everyone involved will be a great help. I like this deal! Spring cleaning is an annual ritual. The time to give the house a makeover. Considering it is a mammoth affair, all the help and accessories needed are welcome to remove the drudgery out of it. These are some valuable tips to make Spring cleaning more effective. We actually just got done with our spring cleaning around the house. We make time to do it every year to declutter and really get everything super duper clean! I am definitely going to descale the dishwasher. THanks for the tip. It could definitely use the pick me up. 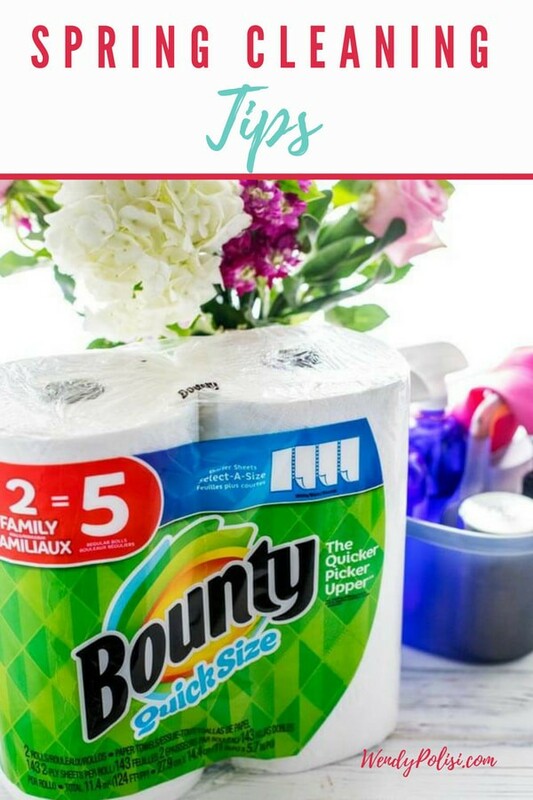 Bounty is the only paper towel I use. They just get everything up so well. Thanks for these helpful cleaning tips. I try to clean my blinds and lamp shades regularly. It makes deep cleaning so much easier! 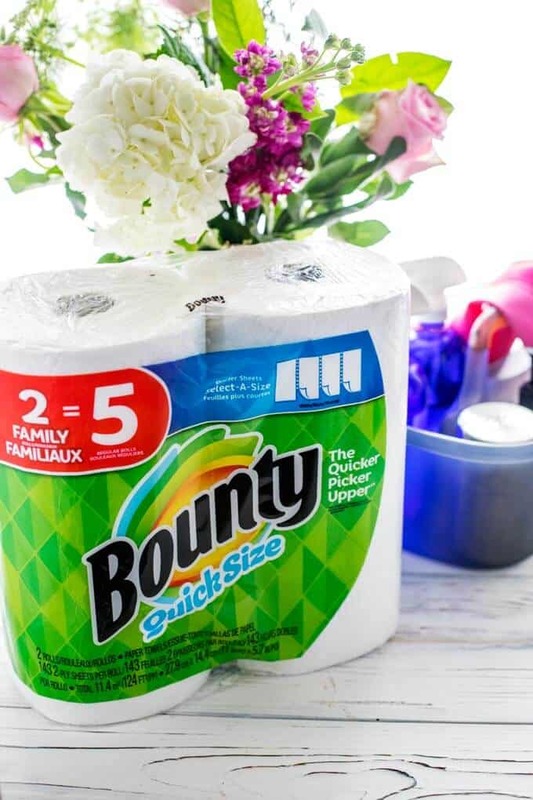 I just ordered this new Bounty paper towel! Absolutely love the size. We use paper towel on daily basis, and always purchase from Amazon. we love and trust bounty for our cleaning needs. very durable and high quality. love that can it withstand all the mess. thank you for this spring cleaning tips, going to utilize it over the weekend. I felt like I’ve done a lot of spring cleaning already, but after seeing your list, I just realized that there’s more to be done. LOL. I should make a list.